Pure Body Sculpting strength training exercises for the advanced exerciser done in a circuit. 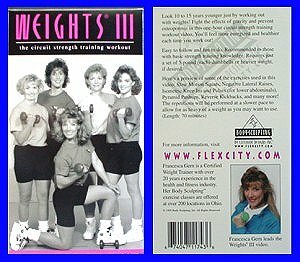 Fitness expert Francesca Fisher and four of her students from 1994 star in this fitness dvd. It combines a strength training workout and a cardiovascular workout by going from one exercise to the next with little or no resting time between sets. The gals in the workout are using 7-pound (each) dumbbells, but you are welcome to use less or more weight if want. You can also custom design this workout to match your fitness level. People that have been exercising with this workout for years typically use three or four different sets of dumbbells or a bodybar to further enhance the health benefits of circuit training. What's nice about this workout is that the time goes by quickly and when you're done, you know you've just had a great workout! Your muscles will feel nicely pumped and toned ~~ just look in the mirror and you'll see what we mean. This DVD has been given a rating of 5 STARS on amazon.com!